Sakile and Vernon first came to our organization a few years ago. They home school their children, and were looking for ways to include public service as a part of their curriculum. “We wanted to show them that, as children, they can still have an impact on their world, even if it is a small way like making someone smile,” Sakile said. But they ran into some difficulties, as many organizations only accepted volunteers over 18. Finding places open to families, especially to families with small children, was challenging. But then they found the Honeycomb Project. Since their first project with us at the Comer Children’s Hospital Classic 5K, where Sakile said they had a blast handing out water and fruit to the runners, the Spellers have attended numerous Honeycomb projects throughout the city. Some of their favorites Honeycomb Project events have inspired the Spellers to bring their volunteer work home with them. For example, after they attended an event where they weaved plastic bags into sleeping mats for the homeless with New Life for Old Bags, their children wanted to learn how to crochet (and in turn sell their creations and become little entrepreneurs). Another example was working in a community garden. “The kids were shocked that the garden was able to grow 600 pounds of food to feed people in the neighborhood. 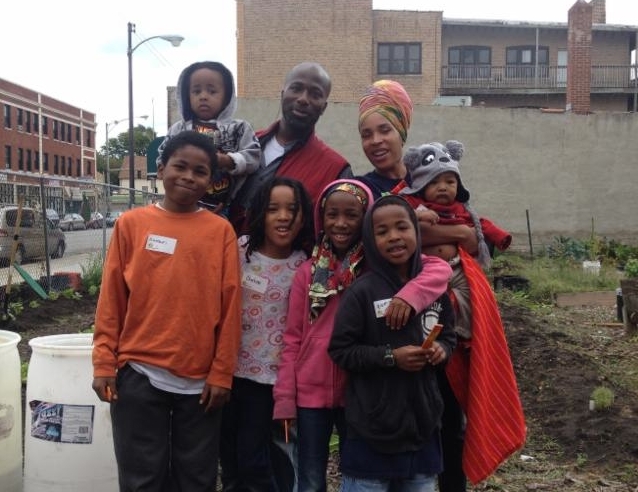 I loved the experience too because they learned about healthy food, teamwork, the environment, and recycling all in one day.” The event inspired them to start composting in their own home, and they have started work on their own garden in their backyard. We hope they send us photos once it is up and running!